Woot, I wrote a script that takes info about what I played on an iPod and sends it to last.fm. Now my last.fm charts can be more accurate. :-D Of course, Sylver is still on the top. I've would be very grateful if you send me this script. I've tried Audioscrobbler, iScrobler, YumiPod... and nothing seems to work with my iPod. Have fun :-) It was tested only on a few iPods, so if it doesn't work with yours, just tell me. I downloaded your scripts and modified the user/password and the path to my ipod mounted. I have looked in the /mnt/usbhd/iPod_Cont/iTunes directory and there are other files (iTunesDB, iTunesPrefs, etc.) but no sign of "Play Counts", any idea of what am i missing or how to fix it?. My system runs Debian stable with 2.6.18 kernel, my version of ruby is 1.8.2 and my iPod is a 5G. "Play Counts" file is normally in the same directory as iTunesDB, iTunesPrefs etc. As far as I know, it is deleted and recreated sometimes (when iTunesDB changes). Maybe for some reason it only got deleted and not recreated ? Did you try playing something or syncing with iTunes (or some other app) ? thanks for the quick reply and sorry for my tardy one. Like you said, that file is recreated when you sync your ipod with itunes, and I seemengly did that before running the script, so there were no songs to be uploaded. S.: You're not doing anything wrong. last.fm recently updated their software, and my program got confused (it expected MD5s in upper case, but they changed to lower case). Just grab the updated version. And that's how you use it - you take output of get_play_counts.rb, remove all songs you don't want people to know you've listened ;-), and use it as input to as_submit.rb. And of course, you need to set your ipod path in get_play_counts.rb, and your username and password in as_submit.rb. Could it be that my version of ruby is missing a library or something like that? S.: According to this post on ruby-lang, it is in Ruby standard library since Ruby 1.8.3, which was released in September 2005. If you have 1.8.2 or older, it's probably easiest to upgrade your Ruby. I have ruby 1.8.2, but will upgrade. I'll get back to you with news as soon as I have it done. is there a complete noob guide to installing this? being a total noob, i wondered how this works, how do i use these files? If you don't have it installed already, install Ruby 1.8.3 or newer. Unpack it (tar xvzf tarball.tar.gz). 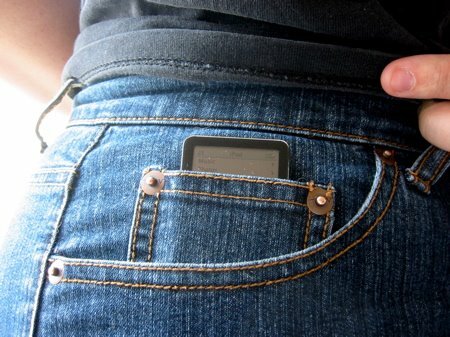 Make sure your iPod is mounted somewhere. Usually it's something like /media/sda2/ or /media/sdb2/. If it's somewhere else, just edit config.rb. Run ./get_play_counts.rb. It will read list of songs you played from your iPod and print it. Does it work ? Great. I finally upgraded to debian testing, got the right version of ruby and got it working. Really great script, I found no other way of submitting songs played in an ipod in Linux, congratulations. Mark: Oops, taw.pl.eu.org is an incredibly old mirror I forgot about, and the version you downloaded is old and buggy. The right website is http://taw.chaosforge.org/ipod_lastfm_bridge/. I will update or remove taw.pl.eu.org soon. iPod downloads. Also read this article on iPod music downloads. I have a dumb question.. How do I even run the script? Anonymus: How are you running it ? Just unpack it, open some terminal, enter the right directory and try ./get_play_counts.rb Should work undex Linux and Mac OS X. What error messages are you getting instead ? # $last_old = "2006-12-08 08:06:14"
Anonymous: Maybe you edited config.rb in some text editor which automatically converted -, :, and spaces to some Unicode charcters which confuse Ruby ? Do you get the same error before editing config.rb ? Do tou get such error if you use a different editor ? hmm, I've tried everything I can think of.. now it says it can't find the .db even when it's pointed in the right place. being on an intel mac wouldn't have anything to do with it would it? perhaps i just wasn't meant to scrobble all of my songs! Anonymous: I just tried it on Intel Mac and I have a solution. Normally Macs don't treat iPods as storage devices, instead they treat them as magical iTunes things. That needs to be fixed by going to iTunes > your iPod > Summary > Options, enabling "Maually manage music" and disabling "open iTunes when this iPod is connected" (as iTunes seem to automatically erase Play Counts). Then disconnect and reconnect your iPod. After that ./get_play_counts.rb worked on Intel Mac. If ./as_submit.rb doesn't update your Ruby - some Macs have very old versions of it (1.8.2 or something). I just found out that in case of too old Ruby as_submit simply says "Network error, retrying" instead of giving a more informative error. I'll fix the error message later. this is pretty useful. do you know if this works on the nano 3g? rockwallca: I don't see any reason why it shouldn't work on nano 3g. While trying to figure it out I changed as-submit to only handshake when needed (the protocol 1 guidelines say plugins should only handshake on start and after repeated catastrophic events like network errors) and display some info using libnotify (nothing fancy, just system("notify-send blah blah")). If you are interested in these, I put up a patch. m0n5t3r: Whatever the spec says, the interval is always 1 second. I'll take a look at the patch later. m0n5t3r: IIRC get_play_counts script prints local dates, and only as_submit converts them to UTC. That might be the source of the problem. Hi there... anychance that you're going to update the script for the BADAUTH problem? I guess I'll have to check with Russ and get a client id first. Do submissions with tst as client id even get imported into the personal user history, btw? Thanks so much for this script! I've wasted such a lot of times with programs like YamiPod, which frustated me no end at times, because it's so buggy and tends to freeze. Now I can at last send stuff easily to last.fm again, which means a lot to me. So, thanks alot! You made my day. how can i start the script under windows xp? Anonymous: It's possible to use it under XP, but it's probably not worth the effort. It's really meant for Linux and OSX, it's trivial to use it on both. don't you know why the lastfm website doesn't accept submitted tracks? it shows only smth like "now listening using Ruby Scrobbler Script" and that's all. newstufflover: I cannot really say, as I don't really use an iPod, but it might be spamfilter. If you use some other program to scrobble in addition to this one, you need to know that if track date (of something you listened to on your iPod a week ago) is older than track date of the most recent already submitted song (which you listened on your desktop computer today), such track will be thrown away silently. tried to apply your help but still no luck. it submits tracks okay and i made sure theirs dates are correct and older than the already scrobbled (played on my computer and scrobbled) ones. but they don't appear in my lastfm page nevertheless.